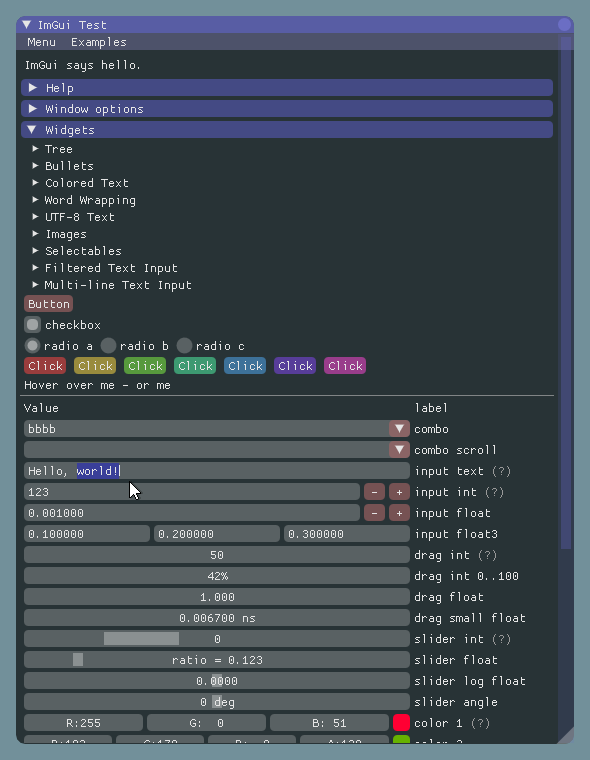 dear imgui (AKA ImGui), is a bloat-free graphical user interface library for C++. It outputs optimized vertex buffers that you can render anytime in your 3D-pipeline enabled application. It is fast, portable, renderer agnostic and self-contained (no external dependencies). 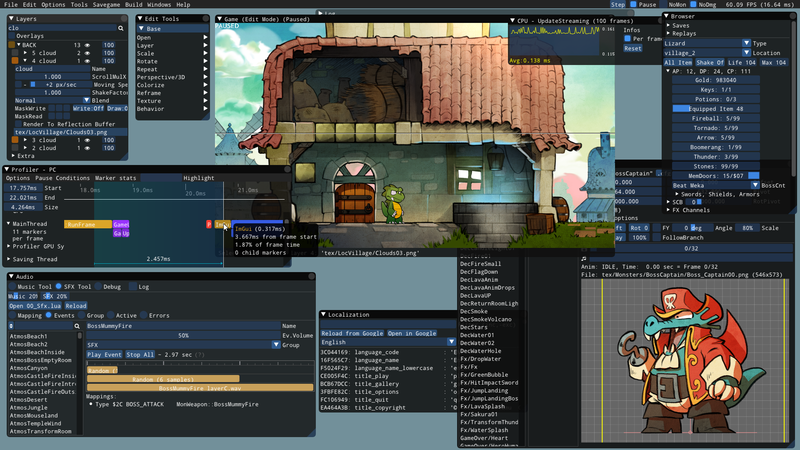 ImGui is designed to enable fast iteration and empower programmers to create content creation tools and visualization/ debug tools (as opposed to UI for the average end-user). It favors simplicity and productivity toward this goal, and thus lacks certain features normally found in more high-level libraries. ImGui is particularly suited to integration in realtime 3D applications, fullscreen applications, embedded applications, games, or any applications on consoles platforms where operating system features are non-standard. 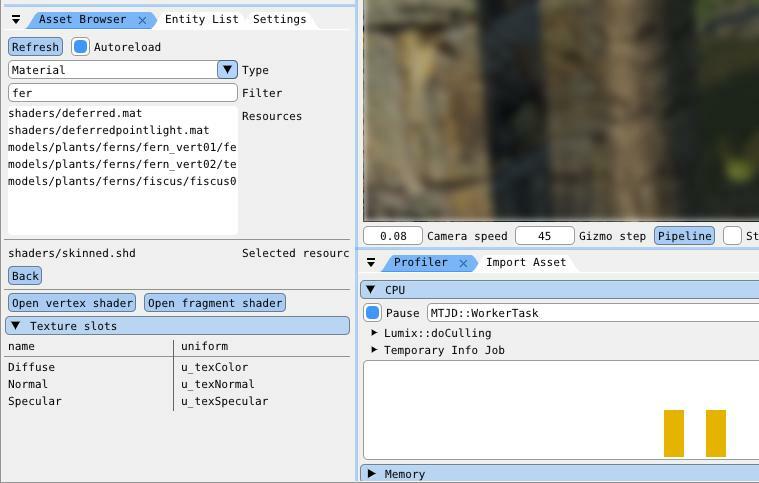 ImGui outputs vertex buffers and simple command-lists that you can render in your application. The number of draw calls and state changes is typically very small. Because it doesn't know or touch graphics state directly, you can call ImGui commands anywhere in your code (e.g. in the middle of a running algorithm, or in the middle of your own rendering process). Refer to the sample applications in the examples/ folder for instructions on how to integrate ImGui with your existing codebase. A common misunderstanding is to think that immediate mode gui == immediate mode rendering, which usually implies hammering your driver/GPU with a bunch of inefficient draw calls and state changes, as the gui functions as called by the user. This is NOT what Dear ImGui does. Dear ImGui outputs vertex buffers and a small list of draw calls batches. It never touches your GPU directly. The draw call batches are decently optimal and you can render them later, in your app or even remotely. 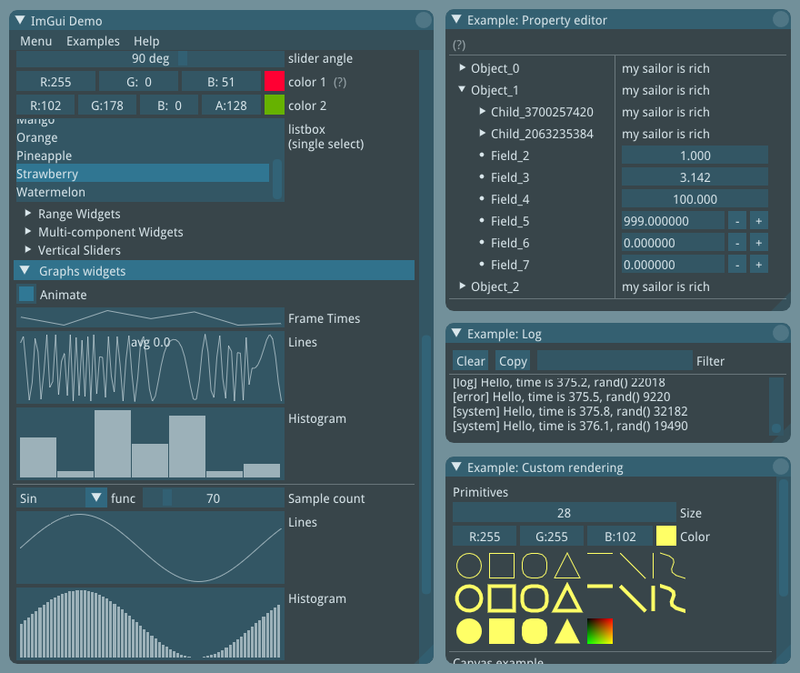 ImGui allows you create elaborate tools as well as very short-lived ones. On the extreme side of short-liveness: using the Edit&Continue feature of modern compilers you can add a few widgets to tweaks variables while your application is running, and remove the code a minute later! ImGui is not just for tweaking values. You can use it to trace a running algorithm by just emitting text commands. You can use it along with your own reflection data to browse your dataset live. You can use it to expose the internals of a subsystem in your engine, to create a logger, an inspection tool, a profiler, a debugger, etc. NB: those third-party bindings may be more or less maintained, more or less close to the spirit of original API and therefore I cannot give much guarantee about them. People who create language bindings sometimes haven't used the C++ API themselves (for the good reason that they aren't C++ users). 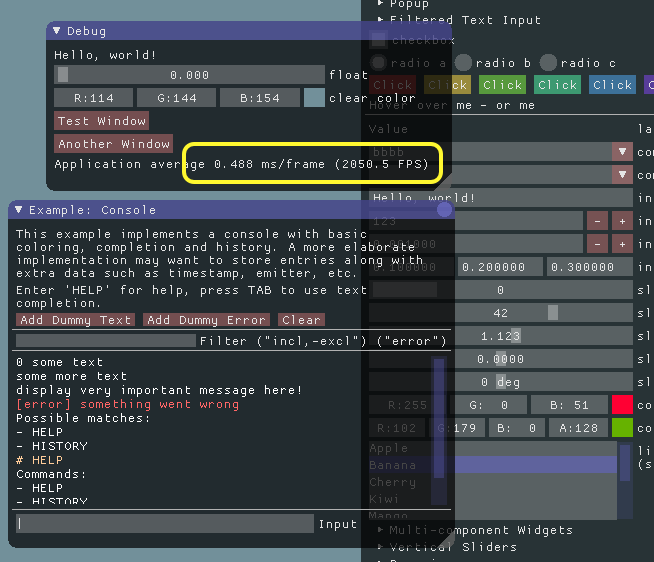 ImGui was designed with C++ in mind and some of the subtleties may be lost in translation with other languages. If your language supports it, I would suggest replicating the function overloading and default parameters used in the original, else the API may be harder to use. In doubt, please check the original C++ version first! See the Screenshots Thread for some user creations. The Immediate Mode GUI paradigm may at first appear unusual to some users. This is mainly because "Retained Mode" GUIs have been so widespread and predominant. The following links can give you a better understanding about how Immediate Mode GUIs works. - Johannes 'johno' Norneby's article. - A presentation by Rickard Gustafsson and Johannes Algelind. - Jari Komppa's tutorial on building an ImGui library. - Casey Muratori's original video that popularized the concept. Example code is in imgui_demo.cpp and particularly the ImGui::ShowTestWindow() function. It covers most features of ImGui so you can read the code and call the function itself to see its output. The library started its life and is best known as "ImGui" only due to the fact that I didn't give it a proper name when I released it. However, the term IMGUI (immediate-mode graphical user interface) was coined before and is being used in variety of other situations. It seemed confusing and unfair to hog the name. To reduce the ambiguity without affecting existing codebases, I have decided on an alternate, longer name "dear imgui" that people can use to refer to this specific library in ambiguous situations. I recommend using Synergy (sources). In particular, the src/micro/uSynergy.c file contains a small client that you can use on any platform to connect to your host PC. You can seamlessly use your PC input devices from a video game console or a tablet. 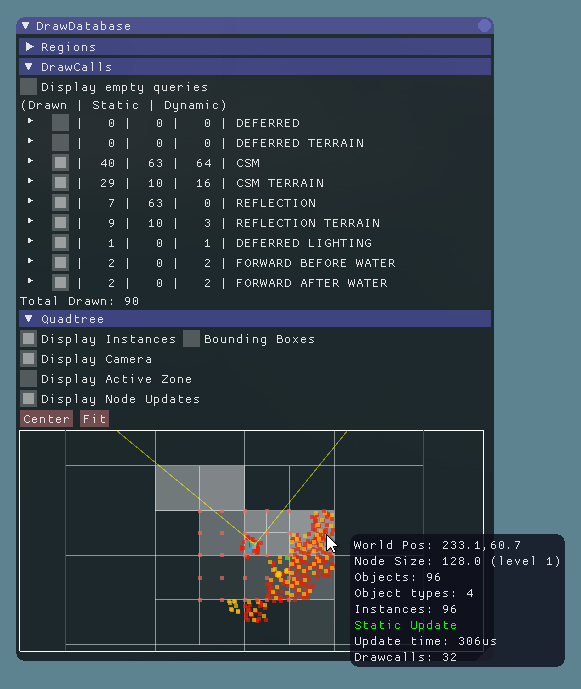 ImGui allows to increase the hit box of widgets (via the TouchPadding setting) to accommodate a little for the lack of precision of touch inputs, but it is recommended you use a mouse to allow optimising for screen real-estate. Yes. I have written data browsers, debuggers, profilers and all sort of non-trivial tools with the library. In my experience the simplicity of the API is very empowering. Your UI runs close to your live data. Make the tools always-on and everybody in the team will be inclined to create new tools (as opposed to more "offline" UI toolkits where only a fraction of your team effectively creates tools). 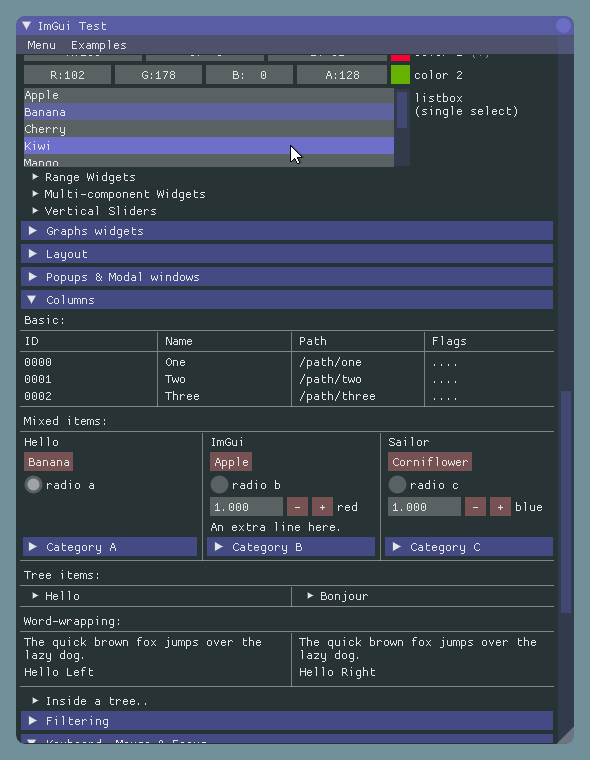 ImGui is very programmer centric and the immediate-mode GUI paradigm might requires you to readjust some habits before you can realize its full potential. Many programmers have unfortunately been taught by their environment to make unnecessarily complicated things. ImGui is about making things that are simple, efficient and powerful. Probably fast enough for most uses. Down to the foundation of its visual design, ImGui is engineered to be fairly performant both in term of CPU and GPU usage. 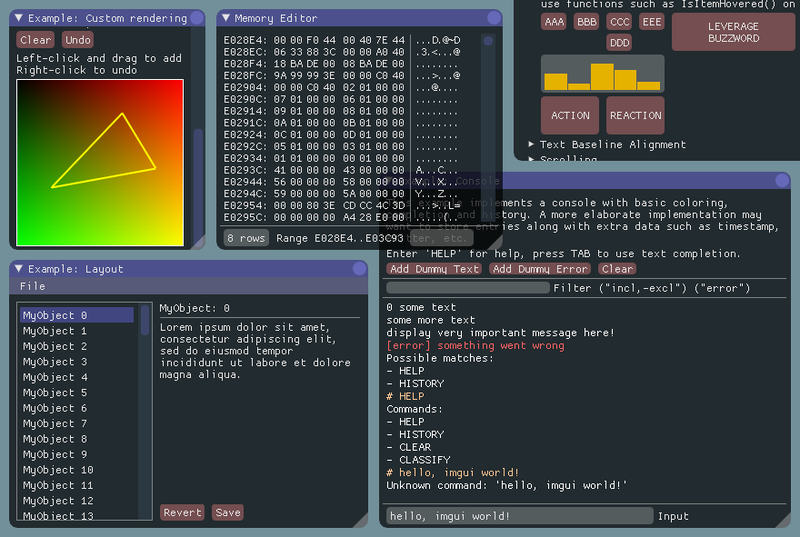 Running elaborate code and creating elaborate UI will of course have a cost but ImGui aims to minimize it. If you intend to display large lists of items (say, 1000+) it can be beneficial for your code to perform clipping manually - one way is using helpers such as ImGuiListClipper - in order to avoid submitting them to ImGui in the first place. Even though ImGui will discard your clipped items it still needs to calculate their size and that overhead will add up if you have thousands of items. If you can handle clipping and height positionning yourself then browsing a list with millions of items isn't a problem. 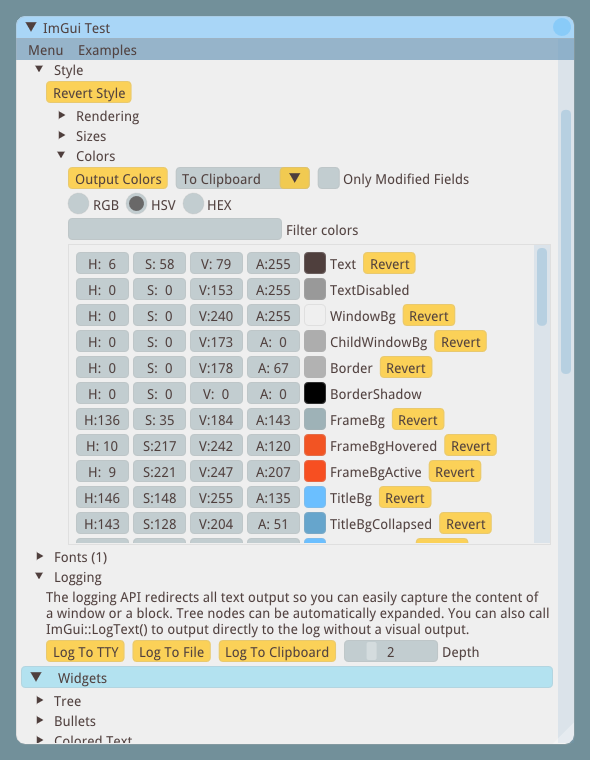 You can alter the look of the interface to some degree: changing colors, sizes, padding, rounding, fonts. 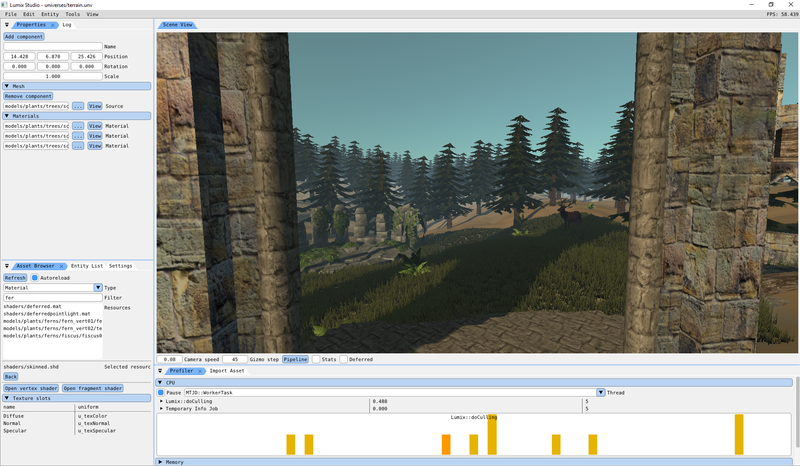 However, as ImGui is designed and optimised to create debug tools, the amount of skinning you can apply is limited. There is only so much you can stray away from the default look and feel of the interface. This is LumixEngine with a minor skinning hack + a docking/tabs extension (both of which you can find in the Issues section and will eventually be merged). ImGui takes advantage of a few C++ features for convenience but nothing anywhere Boost-insanity/quagmire. In particular, function overloading and default parameters are used to make the API easier to use and code more terse. Doing so I believe the API is sitting on a sweet spot and giving up on those features would make the API more cumbersome. Other features such as namespace, constructors and templates (in the case of the ImVector<> class) are also relied on as a convenience but could be removed. There is an unofficial but reasonably maintained c-api for ImGui by Stephan Dilly. I would suggest using your target language functionality to try replicating the function overloading and default parameters used in C++ else the API may be harder to use. It was really designed with C++ in mind and may not make the same amount of sense with another language. Also see Links for third-party bindings to other languages. I'm currently an independent developer and your contributions are useful. I have setup an ImGui Patreon page if you want to donate and enable me to spend more time improving the library. If your company uses ImGui please consider making a contribution. One-off donations are also greatly appreciated. I am available for hire to work on or with ImGui. Thanks! Ongoing ImGui development is financially supported on Patreon. Salty caramel supporters: - Jetha Chan, Wild Sheep Studio, Pastagames, Mārtiņš Možeiko, Daniel Collin, Recognition Robotics, Chris Genova, ikrima, Glenn Fiedler, Geoffrey Evans, Dakko Dakko. Caramel supporters: - Michel Courtine, César Leblic, Dale Kim, Alex Evans, Rui Figueira, Paul Patrashcu, Jerome Lanquetot, Ctrl Alt Ninja, Paul Fleming, Neil Henning, Stephan Dilly, Neil Blakey-Milner, Aleksei, NeiloGD, Justin Paver, FiniteSol, Vincent Pancaldi, James Billot, Robin Hübner, furrtek, Eric, Simon Barratt, Game Atelier, Julian Bosch, Simon Lundmark, Vincent Hamm, Farhan Wali, Jeff Roberts, Matt Reyer, Colin Riley, Victor Martins, Josh Simmons, Garrett Hoofman, Sergio Gonzales, Andrew Berridge, Roy Eltham, Game Preservation Society, Kit framework, Josh Faust, Martin Donlon, Quinton, Felix.